In 1975, the Irby family of Sargents, Colorado donated this building which was located on their ranch. It contains railroad artifacts and memorabilia, telegraph equipment, photographs, traveling trunks and a display of the stationmaster's quarters. The tower was moved to the museum site from Mears Junction, Colorado. It was located on the east side of Marshall Pass and was filled with 50,000 gallons of water. The water was hand-pumped from a well or hauled from a nearby creek or spring. The tower was moved in 1971 and erected on site by the Bill Endner family. 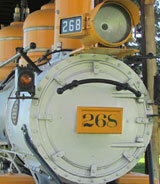 "Cinderella" was built in 1882 by Baldwin Locomotive Works and was used for 73 years in the Gunnison area. Only 3 narrow gauge trains remain of the 150 C-16 model engines built. This engine has been on display at the Chicago Railroad Fair, "Rush to the Rockies Centennial" and in the film "The Denver and Rio Grande”--1951. 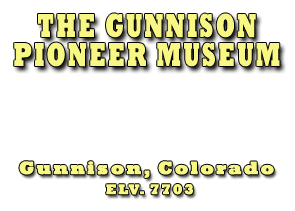 The engine made its official final run on September 28,1954 from Sapinero to Gunnison. On June 30, 1955 this engine was used as a workhorse in pulling up the railroad tracks in the Gunnison area. The flanger, which was mounted behind the engine, was used to remove snow and ice from between the rails and to push it off of the track. A snowplow, mounted on the front of the engine helped to break the track open. This particular flanger was built in 1885-1888. This car was used to haul coal. Thousands of tons of coal were shipped from the mines in the Gunnison Valley. Most of the ore came from the mines in the Crested Butte area. As many as 25 coal cars were shipped daily to the Colorado Fuel and Iron Company in Pueblo, Colorado. This car transported hay, grain and a wide variety of freight. Anything that the stores sold (barrels of gasoline, foodstuffs, dry goods) had to be brought in by train. This double-decker car was used to transport sheep. If the decking was removed, the car was used to haul cattle and horses. The interior of the caboose is much as the conductor left it. The caboose was where the conductor, maitre d' and PR man of the train, traveled. The brakeman and switchman also rode here, but the brakeman rode in the cupola where he had a 360-degree view of the track. When stockmen shipped their stock to market they had a choice of riding with the stock or in the caboose. Sometimes this was a difficult decision for them since miners, railroad folk and cattlemen didn't always get along. A separate crew from the train used this weed burner to clear brush from along the tracks to help prevent grass fires.